The original flow fun in a can! The original fun-in-a-can! These 3 oz. 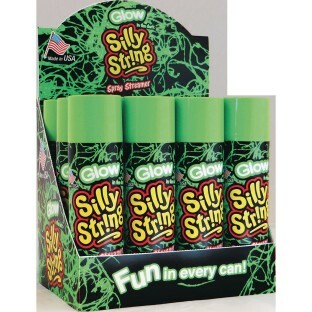 cans of Silly String™ Brand Spray Streamer deliver a whole lot of string, yet are small enough to fit smaller hands or be concealed until you’re ready to go all silly on your favorite target! Once it's exposed to light, it will glow in the dark for oodles of in-the-dark fun! Made in the USA it has been delighting kids of all ages for more than 40 years. Non-toxic and non-flammable. Pack of twelve 3 oz. cans of wonderfully wacky spray string in a can that glows.